Pub quiz fundraiser – help us get to Beach Brawl! Like a good pub quiz? Come along to our quiz night on April 10: you can show off your knowledge, win amazing prizes, and help us fundraise for our trip to Florida! 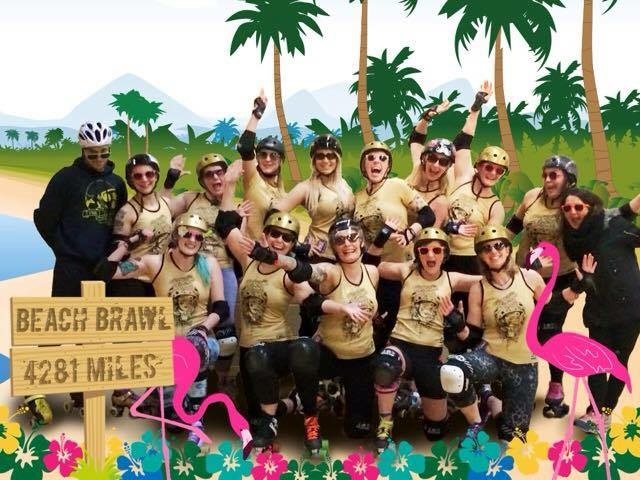 Newcastle Roller Girls’ Canny Belters will be heading to the USA in May, to compete at Beach Brawl in Florida. It’s a really big deal for us – we’ll be playing against high level teams (from the country that invented roller derby!) and a strong performance could massively boost our global rankings. …and our next event is a pub quiz! On Sunday 10 April 2016 we’re hosting a pub quiz at The Ware Rooms Bar in central Newcastle. Entry is £2 per person, and you can have up to 5 people on a team. 7pm, 10 April 2016 at The Ware Rooms, 17 Carliol Square, NE1 6UQ Newcastle upon Tyne. Join our Pub Quiz Facebook page to let us know you’re coming, and to see what other prizes we announce in the next few weeks!